Agents with Cushman & Wakefield/The Lund Company were awarded multiple CCIM BIG Deal awards. 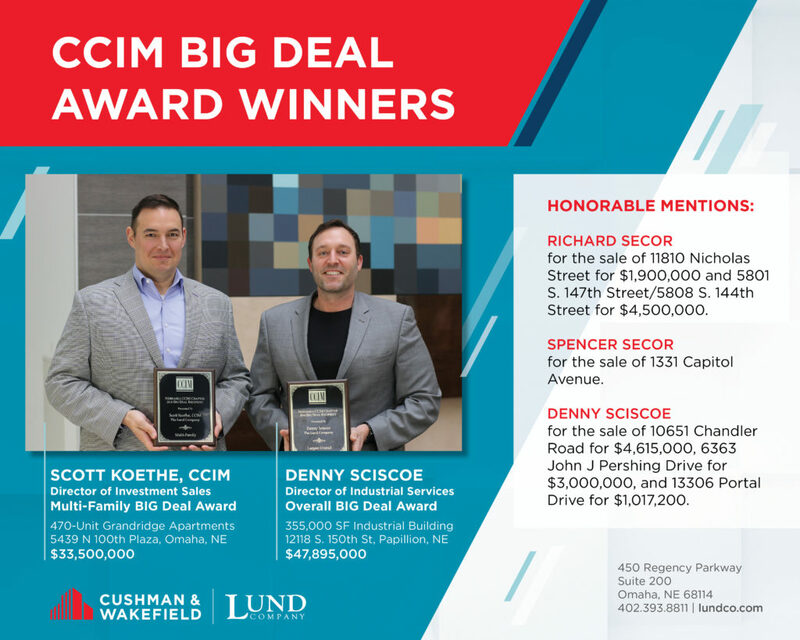 Cushman & Wakefield/The Lund Company is proud to announce two of their agents have been awarded multiple awards at the 2018 CCIM BIG Deal awards banquet that took place on March 27, 2019 at Quarry Oaks Golf Club. Awards are given for the largest transaction in the office, retail, industrial and multi-family sectors, along with the overall largest transaction completed in 2018. Cushman & Wakefield/The Lund Company agents were awarded with two BIG Deal awards, including the Overall BIG Deal award and several Honorable Mentions. The Overall BIG Deal award was presented to Denny Sciscoe for the sale of 12118 S. 150thStreet in, a 355,000 SF industrial building in Papillion NE for $47,895,000. Scott Koethe was awarded the Multi-family BIG Deal with the 470-unit sale of Grandridge Apartments at 5439 N. 100thPlaza in Omaha, NE for a sale price of $33,500,000. Denny Sciscoe for the sale of 10651 Chandler Road for $4,615,000, 6363 John J Pershing Drive for $3,000,000, and 13306 Portal Drive for $1,017,200.